I read this article and found it very interesting, thought it might be something for you. The article is called ‘Querida Amor’ and is located at http://modernloss.com/querida-amor/. During my childhood, Valentine’s Day was a glitzy, mushy spectacle. It was a loud carnival of cards and candy—candy that I was otherwise not allowed to have during the rest of year. The day was splashed with blood heart red—red hearts, red ink, red love. It was one of the few days of the year my father stepped away from his stern image and was outright affectionate. That affection came mostly through the plethora of cards he sent to my mother and us kids, always through the mail. My father has been dead for 17 years. Before that, he had Parkinson’s disease in the decade leading up to his death. Parkinson’s robbed my father—a man who was a generation older than my mother—of his strict and orderly persona. He was a man very much of the American 20th century, having served in the Second World War as a lieutenant commander on a supply ship in the Pacific. He brought the discipline of the war years to our house and infused our routines with it. It was his habit to do 50 pushups every morning and frequently took brisk mile-long walks before work. He was the looming father of my childhood who forbade sugary cereals, sodas and chocolate. “Have a banana,” he said when I craved something sweet. The sweetest things he allowed were the chewable iron and Vitamin C tablets I took each morning. I don’t remember getting sick in the fiercely cold Connecticut winters. My father was scary to me except on Valentine’s Day. In delicious anticipation of the day, he mailed us cards that were exceptionally treacly. Cards that were the Hallmark equivalent of the Cap’n Crunch cereal we only had at my aunt’s house. These were large cards—cards so hefty with glitter and sentiment, they required extra postage. As much as I loved those cards, I loved the way my father addressed them even more. Those pink and red envelopes were addressed in my father’s precise block print. I never saw him write anything out in script except for his signature on checks and Valentine’s Day cards. He had a strict color scheme when writing out a check—the date in red, the payee in blue, the dollar amount in green, and his scrawled signature in black. My dad’s envelopes mirrored the idiosyncratic color scheme of his checks. 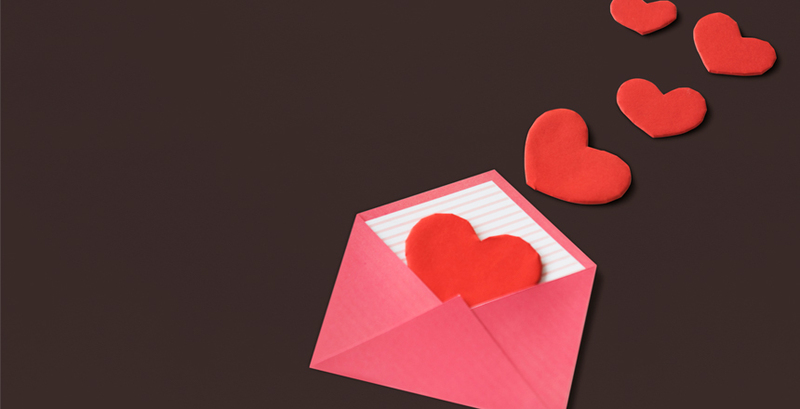 On Valentine’s Day, the addressee was in red (unless the envelope was red. In that case he used blue ink). The return address was always in green both in the front and the back flap of the envelope. The envelope was a marquee that screamed my name like a neon headline—Miss Judith Frances Bolton. He addressed the card as “My Dearest Child,” and signed it “Love, Daddy.” The card felt formal yet loving. To my Cuban mother, he wrote—Querida Amor—Dearest Love—and signed it “Your Papi”—a moniker of rare affection between them. The annual love and glamour of the day were as dependable as a sunrise. Those over-the-top cards arrived every year exactly on February 14. I confess that as wonderful as Valentine’s Day has been with my husband and children, nothing about the day has been quite as exciting as the cards my father mailed to me. I wish I had saved them. He wasn’t a talkative man, which made the cards all the more revelatory and meaningful. There was always a lot of empty air between us. On phone calls he muttered, “Nice to talk to you,” even though he barely uttered a couple of sentences. The long, humid summer I was nine, I learned the hard way how much my father seemingly disliked the telephone. That was the summer my parents separated, and he rarely called. My mother had taken us three children down to Miami on a 23-hour train ride that made us collectively heartsick, motion sick and homesick. We ended up in the rundown Royal Hotel near my mother’s relatives in Miami Beach. My father wired us money to move to better quarters, but my mother used the funds to pretend to be a rich Americano’s wife by treating her cousins to restaurant meals. I missed our two-story colonial back home, the one with an electric dryer instead of the makeshift clothesline outside our hotel window. At home, we had an impressive stove and oven combination instead of the single blackened hotplate in our room. But most importantly, our father was back home. My mother called the woman who ran the hotel “la dueña”—the proprietor. Although la dueña lived in the heart of the Cuban exile community, she didn’t like Latinos. And she especially did not like my family and me. She sensed we came from a better place and that hard times had landed us at the Royal Hotel. When my mother’s bathing suit was stolen off the clothesline, la dueña had no sympathy. “You look like you can afford to buy a new one,” she hissed at my mother. It had been weeks since we heard from my father and la dueña knew how much I wanted any communication from him. I asked her every day if I had mail. If I couldn’t be with my father, at least I could have his perfect grammar-school print in primary colors over which to linger. The handwritten characters lined up like soldiers—carefully wrought characters that communicated a love and closeness of which he never spoke. Even at age nine, I knew that handwritten cards were intimate, urgent documents. I wanted a Valentine’s Day card in July. “Nothing for you,” said la dueña sharply. Nothing for Miss Judith Frances Bolton. My parents eventually reconciled. But after that summer the Valentine’s Day cards stopped. It was as if my parents’ separation created a memorial to what love had once been in our household. Over the years, I clung to my father’s handwriting. I cherished the grocery lists he wrote out on pieces of the shiny cardboard inserts that came with his laundered shirts. I saved the scraps of paper ordering me to make sure the windows were closed or the dishes were done. Decades later as my father was dying his handwriting grew crabbed and crowded. He no longer wrote out the stalwart letters that were characteristic of his lovely printed handwriting. His signature, which once had gravitas, was scrawled and messy. I could not make out the distinct K. that once anchored his name. My father was leaving us, and so were his telegraphed messages of love.